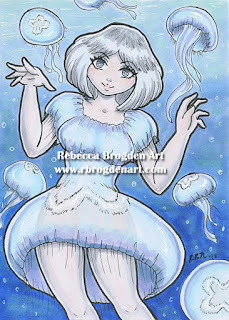 Description: Original 8.5 x 11 copic marker drawing on Xpress It Blending Card. Out of all of my copic marker drawings to date, this one took me the longest to complete at a minimum of 10 hours. I lost count of time after that. 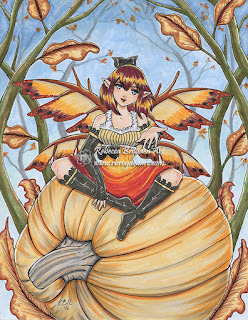 This fairy sits comfortable on a fresh pumpkin inviting one to come and join in the golden harvest. I plan to enter this into my local state fair in the fall.